Morphies Law was announced for Nintendo Switch last year but there has been no news on when it would be coming to the system. It does seem that we could be close to hearing about a release as Cosmoscope has been busy on their Twitter feed providing updates about Morphies Law as of late. The latest tweet shows off the winning game icon for Nintendo Switch. Update date for Morphies Law has also been found on Nintendo’s servers so there is a possibility that the game could see release some time sooner than later. 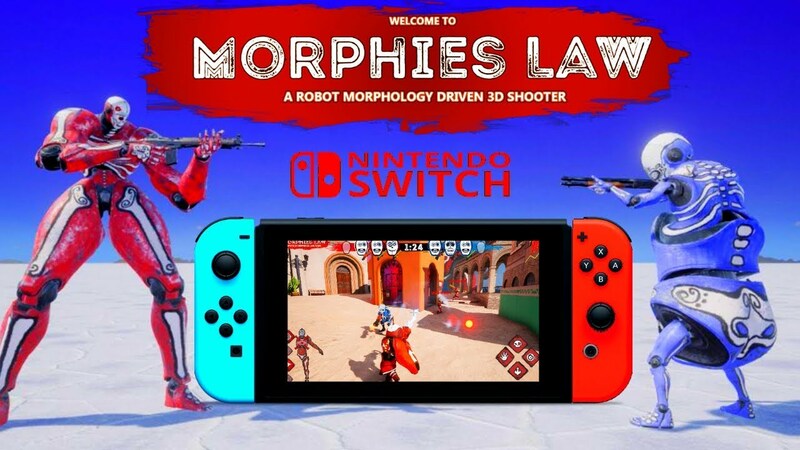 Morphies Law is a shooter with a difference that has players tactically shoot at each other in order to change their abilities like shooting at the legs of the opponents to make their own jump higher and the like. With teams of shape-shifting robots, this is no ordinary shooter! Hitting a Morphie’s body part will make it shrink…and make that same body part on the shooter grow. As the size of each body part changes, your abilities will change too, forcing you to change tactics as well. Larger legs will improve your jumping game, and your hand size changes the way you use your grappling hook. Clever players might even transform their allies on purpose.